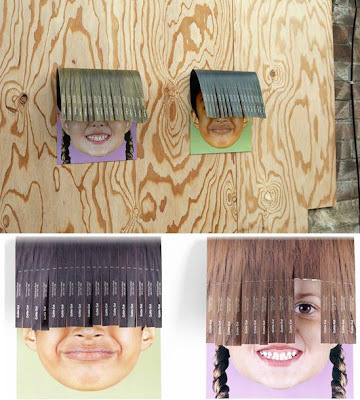 A cool and creative collection of tear off ads from all over the world. Bosch - Calendar: "Every page in the calendar is cut in a special way to initially create the individual impression of an untended lawn. The recipient becomes part of the action and tears off a calendar page every day. By doing this, he is actually continuing to 'mow' day by day and so, bit by bit, he has a perfectly cut lawn in front of him at the end of the year. It's an authentic and unique mowing experience, because the width of the calendar corresponds exactly to the width of the lawn mower." 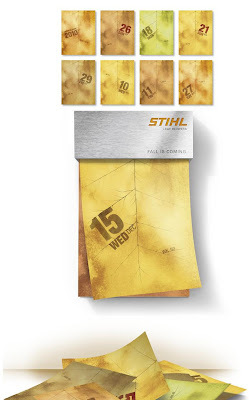 STIHL Leaf Blowers - Autumn Calendar 2010: An interesting concept developed to promote the product of leaf blowers by STIHL. "The first tear-off calendar, that tears off its leaves automatically. To show the necessity of STIHL leaf blowers in an entertaining way - day by day. Due the fact that leaves fall in autumn, their calendar covers the time period 09/23 - 12/21." GBB Beauty Salon - Bikini Waxing Poster: "To promote the recently opened GBB beauty salon in one of the biggest office buildings in Bucharest, to the women that work in the building, with a minimal budget. The office building is a busy place, so they needed a surprising way of drawing ladies' attention. They placed special posters in the building lobby. The women were invited to tear off one of the hairs and call the number written on it for a reservation, thus demonstrating how easy waxing becomes when using the salon's services." 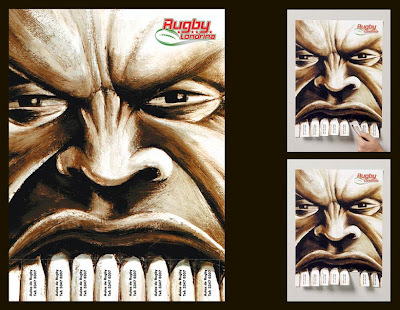 Pantogar Memo Pad: These memo pads were created as a part of Pantogar (for hair growth) advertising campaign. 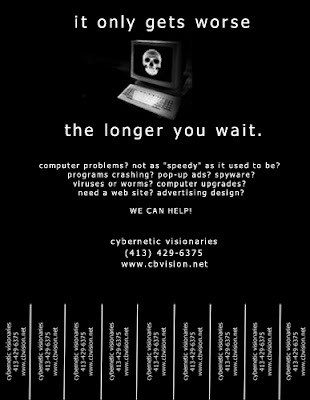 The idea was quite simple but impressive and effective. 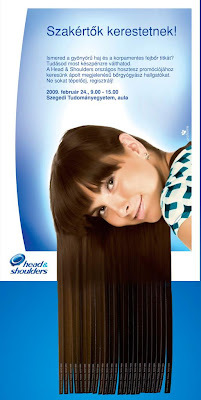 It was created to remind people of the problem of hair loss that is gradual and people tend to neglect it. 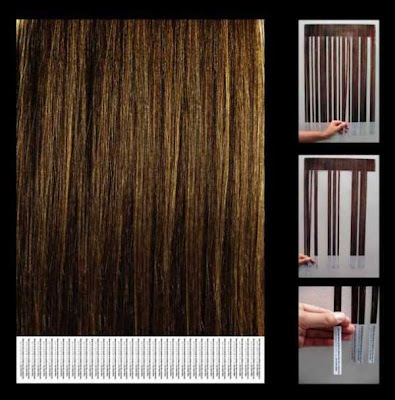 As the user uses these sheets of this memo pad, the illustrated person's hair becomes thinner and thinner. 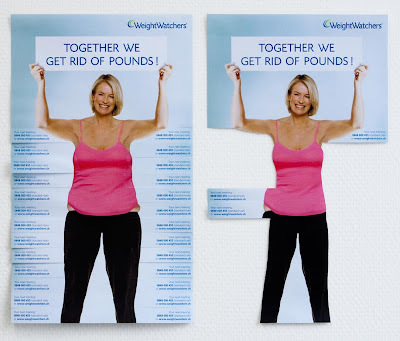 WeightWatchers Tear-Off Posters: "The tear-off layout is made way more interesting and it encourages people to take a part of the poster. It is because every torn part makes the woman on the poster look thinner." 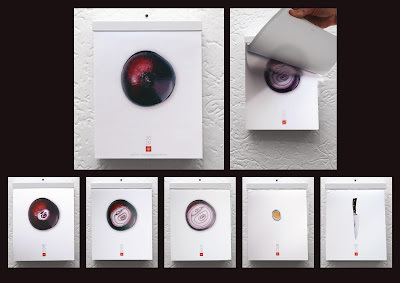 Wüsthof knives - Onion Calendar: "To dramatize how precisely Wüsthof knives can cut an onion calendar was created, in which an onion was cut into 365. Precisely as many as there are days in the year. Perfect for a tear-off calendar." Zohra Mouhetta: "The brief was to design a business card for fitness trainer Zohra Mouhetta. To stand out from all the leave-behinds people receive every day, they designed a unique, foldable business card that invites the recipient to interact with it. In a world of standardized and formatted business cards, Zohra's card stood out and made for a memorable hand out. Its design not only complemented her profession, but also demonstrated the effectiveness of her personal training programmes by inviting the recipient to tear off excess flab." 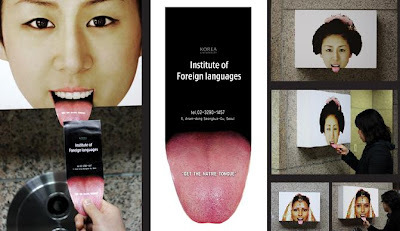 Institute of Foreign Languages - Tongue: Get the native tongue. 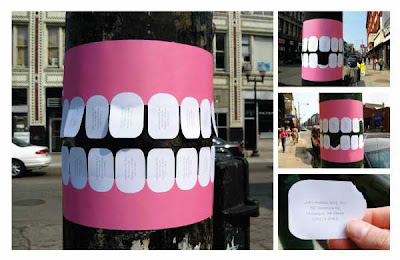 Dentist - Teeth: A dentist came up with a creative approach for advertising hisdental services by posting telephone pole flyers with tear-off teeth. 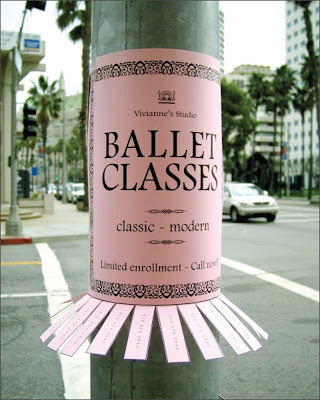 Vivianne's Studio - Ballet classes: Self promotional poster for ballet lessons. Martial Art School - Teeth: A self promotional poster for Martial Art School; just pull out one of the teeth and call for a lesson. 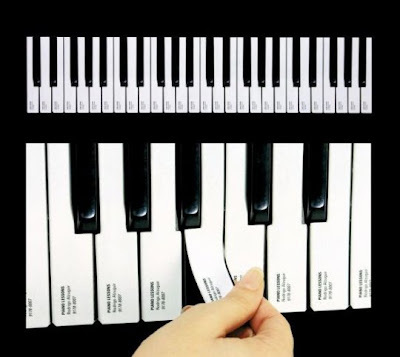 Tear Off A Piano Key: This creative ad was created for a professional piano teacher and was displayed in record stores, music schools and libraries. 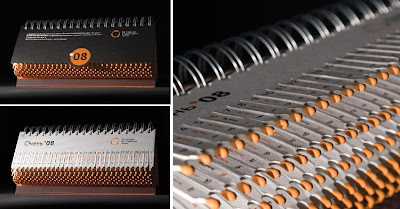 Tear-Off Match Calendar: Each page is a month and it looks like a comb made of matches that correspond to the days. The matches used for the construction are real. 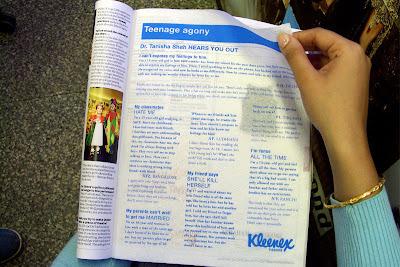 Kleenex: A column of the magazine is printed on a Kleenex tissue paper. 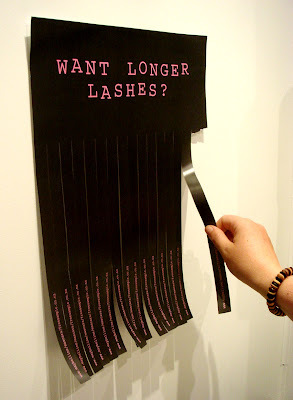 Maybelline Mascara: This bathroom advertising campaign invites women to tear off the eyelashes which directed them to the company's website to avail a sample of their mascara.